Gizmodo reader Andrew Friend was strolling yesterday through the Pentagon's North Parking back to the office when he noticed the car above, MIT's entry in the DARPA Urban Challenge, which aims to produce a car that can run completely automated in any conditions, without human intervention. He reported today that all the challenge cars arrived today—"they must be doing something on the weekend when the parking lot clears out," he said. With no notice of a new challenge, what are all those cars doing there? Some possible answers, Google Maps location and a video showing how good these cars are, right after the jump. Updated: check the extra images from different cars and all the details about what is going on from another reader at the Pentagon right now. 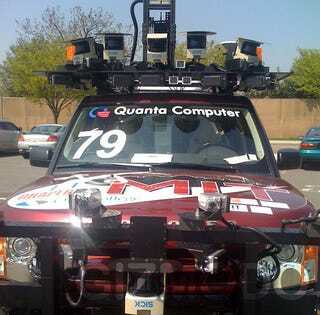 I've got pics from the DARPA cars at the Pentagon. The six finalist teams were there for the Urban challenge and they had a briefing at 1145 in the auditorium as well as showed off the vehicles from 0945-1300 in the center courtyard. Besides launching a robotic coup against the U.S. military? They are really just showing off what they've done. Because the actual DARPA Urban Challenge comp has already happened, they are really here to just show off what DARPA has been up to to the military brass. I don't know how familiar you are with this, but the DARPA challenge had two parts: the off-road, and the Urban. The Urban was obviously a much greater challenge and in talking with the guys there were something like 90 teams who had to have their vehicles navigate a military air base (think small suburb) with their vehicles and hit a series of GPS check points. According to them they were allowed to drive around the area 24 hours before so they could get a feel of it, but then on the day of they were given a USB stick that had 10-15 gps check points the cars had to hit. So they loaded that into the computer, but were not allowed to load any sort of "route" in. Then they just had to it start on the autonomous vehicles and hope for the best. What's really cool—like all of this isn't already—is that they had something like 50 stunt drivers drive around the area while the robocars were moving to challenge the vehicles and make sure they didn't collide. As you can tell, 6 of 90 teams (it could have been a few more) were the only ones able to succeed, so it was quite the task.